Debt is rising at an unsustainable pace and debt levels will become unsustainable well before the end of the decade. This follows from the above point – if investment is debt funded and if it is being wasted, then by definition debt must be increasing at an unsustainable pace – i.e. faster than debt-servicing abilities. In the past three years this warning about rising debt has become much more widely accepted, especially since Victor Shih started counting local government debt in late 2009. There is still some disagreement on the sustainability of debt, with some analysts, like Arthur Kroeber of Dragonomics and the guys at The Economist, saying that China doesn’t have a serious debt or over-investment problem. I suspect nonetheless that in another year or two no one will doubt that the Chinese growth model tends towards unsustainable debt and that we are rapidly reaching the limit. As so often in life, it's one thing to be right on the general direction of things, but another altogether to get the timing right. I don't dispute that Pettis will eventually be right, but I do continue to wonder about the timing. If we regard the entire country as a black box (perhaps appropriate for a system with as much central command-and-control as China's economy-formerly-known-as-communist), then the current account balance represents the degree to which the entire system is more then paying for itself. 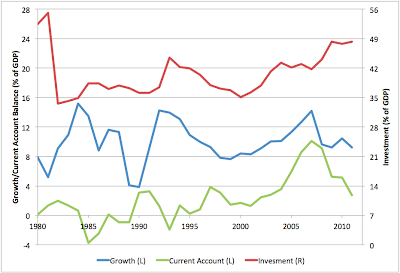 This chart shows the IMF figures for total investment as a fraction of GDP (red, right scale), together with GDP growth (blue) and current account balance (green) both on the left scale. You can see that post the 2008 crisis, investment, always high was ramped even higher in an attempt to preserve growth. Growth nonetheless fell, but still remains at a high level. Meanwhile, the current account surplus has been falling from the incredibly high levels of 2006-2007. 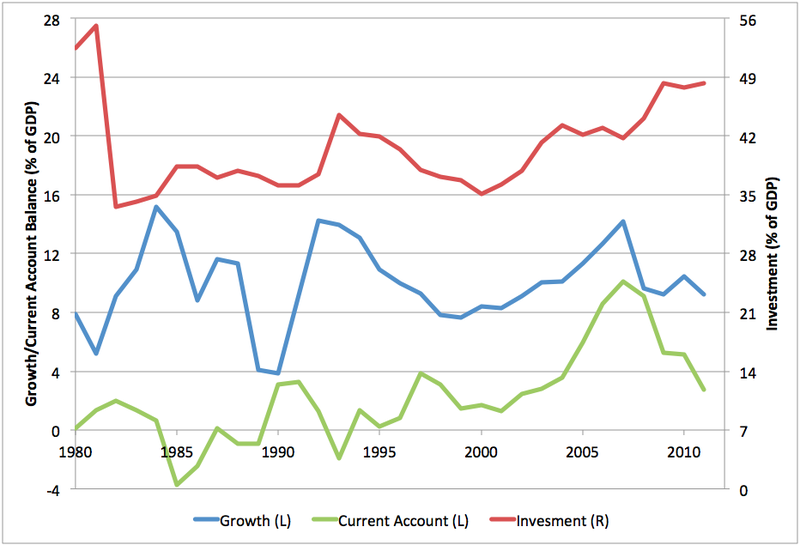 You can tell a story about how this fall is due to increasing levels of bad investment generating poor returns, thus causing China to have to pay more to it's raw material suppliers for the means of all this investment which is no longer generating as much income, so the current account surplus is falling. But even if we accept this story, it's easy to see that an external crisis cannot be close - China is still in surplus, and if it fell into deficit, it could probably run a deficit for many years before disaster struck (see the US for example). So the story about excessive debt bringing an end to the boom, if it is to happen in the next year or three, has to be a story about strictly internal imbalances - that some sectors within the economy become over-indebted and the central government is unwilling to act to rescue them and keep growth going. It cannot be that the central government is unable - since the country as a whole is running a large surplus. So it would have to be that the government is unwilling. And given the total commitment to rapid growth the government has displayed for several decades now, I haven't yet heard a persuasive story along those lines. I am not sure I agree with this argument Stuart as it confuses stocks and flows. A country can engage in excessive investment that results in the sale of highly competitive exports and a healthy current account surplus. However, in effect, the balance sheet is deteriorating at a faster pace than the income statement is improving. Having seen the end of the Japanese bubble economy while living in Tokyo I can vouch for that. And yes it is true that Japan has not faced a balance of payments crisis (yet), but it has certainly faced a growth crisis. In the process, it has come to provide almost zero effective demand for the global economy. With this as background, I don't think Pettis is arguing that China will collapse into a black hole of external debt overnight, but rather that it will turn into the global locomotive of growth that unfortunately gets derailed. China pessimists aren't worried about a Greek-style credit crash, they're worried about a Japan-style end to growth. You can only build roads, factories, high speed rail and condos for so long, and then you have too much, and the best you can do is prevent a crash. Keeping growth going pas that point is much harder.